The F.W.ABRAMS, was owned by the Standard Oil Company of New Jersey. The tanker had been built in 1920 for the W. R. Grace company and was originally named "Nora". W. R. Grace sold Nora to the Standard Oil Company (now better known as EXXON) in 1932 and they renamed the tanker F.W.Abrams. The F.W. Abrams was en route from Aruba to New York with 90,000 barrels of fuel oil when the mishap took place. Routing instructions had been issued by the British in Orangestad and ordered the F.W.ABRAMS to anchor at Cape Lookout only if the vessel arrived at that position after 1600, otherwise to contact a patrol boat or lightship off Ocracoke for further instructions. The routing orders did not mention the Cape Hatteras anchorage or more importantly the Cape Hatteras minefield. Following an uneventful trip north, the F.W.ABRAMS passed Cape Lookout at 1130 on June 10 and continued on towards Ocracoke where a Coast Guard patrol boat directed Captain A. J. Coumelis, of the F.W.ABRAMS, to anchor, which was done at 1830 on June 10. The early morning of June 11 found extremely inclement conditions, and although the sea was moderate, the weather was squally, a heavy fog alternating with rain and visibility in general was limited to one-quarter of a mile. At 0350, the F.W.ABRAMS made all preparations to get under way at 0415, with anchor aweigh, the ship departed from the anchorage under the guidance of the Coast Guard patrol craft. As the tanker drifted, a second explosion was felt to rock the ship at 0717. This took place forward of the pump room on the starboard side and resulted in the flooding of the pump room and buckling of the deck. Captain Coumelis related that the plates were bent in on the starboard side and bent out on the port side. At this time, part of the crew left the ship. At 0739, the third explosion occurred on the starboard side between the bow and the bridge and at this time, the vessel sinking slowly by the bow, was abandoned by all hands in the three remaining lifeboats. All of the remaining members of the tanker's crew of 36 men left the ship, and subsequently reached shore safely at Ocracoke Inlet from where they were transported to the Marine Air Station at Cherry Point. The entire crew was American except the two Filipinos and one Spaniard. The only injury sustained as a result of the unfortunate incident was a dislocated ankle and a broken arm suffered by Hanley, an able bodied seaman who had been on watch near where the first mine exploded. At 1755 on June 11, as the weather cleared, the battered hull of the F.W.ABRAMS was observed with her forward half submerged and apparently on the bottom, at a reported position of 34-58N : 75-48W, drifting to the north. The last known position of the derelict was reported on June 13 to be 35-50N : 75-45W, completely submerged. These 1942 position reports are very close to where the wreck of the F. W. Abrams has been found to actually be, 34-59N : 075-48W about ten miles South of Hatteras Inlet. It was indeed a mine that destroyed the F.W.ABRAMS and she was not the only vessel to be lost to the Hatteras Mine Field during the war. The vessel KESHENA met a similar fate and also lays on the bottom nearby. The F.W.ABRAMS now has 80 feet of water covering her resting place. Because she was a large vessel and a hazard to navigation, the tanker was depth-charged and wire dragged, flattening the wreck and spreading the amidships section out over a wide area. The military pilots in training from Cherry Point also used the Abrams as a bombing target as her masts protruded from the water. The stern, which is the most visually interesting section to dive, is well defined with both Port and Starboard sides of the hull visible. The fantail is settled into the sand so deep only the tops of the rudder and prop are seen, but the engine still sits upright on it's bed and rises almost 20 feet from the bottom. Some sections of the engine have recently fallen to the starboard side, but the majority of the engine still stands upright. Ahead of the engine are three boilers all in their original positions nested close together. Forward of the boilers the wreck becomes less distinct and divers must use careful navigation skills if they are not to become disoriented. Wide sand breaks divide the wreck into three main sections, with just enough distance between them to make it sometimes difficult to navigate between them. If the visibility is over 60 feet, a diver can see from the stern section to the amidships portion of the wreck and swim the gap without problems. The gap between the amidships and the bow section is not as wide and almost not noticed during a dive. The bombing and wire dragging did a very good job in the midsections of the Abrams as they are a disorganized pile of beams, steel plates and ladders. The sand break between the mid-section and the bow area is smaller and less distinct than the break between the stern. The bow area is also rather jumbled until you reach the actual bow where the general shape is still clearly defined. 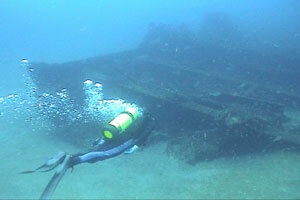 Divers will clearly see the large anchor winch, chain pile and port side of the bow. 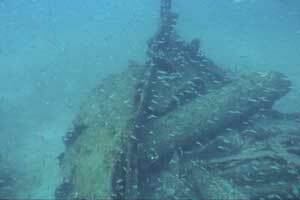 The bow section normally holds a great deal of fish life as it provides a jumble of plates and beams under which the groupers, snappers and other fishes can hide. Below is a detailed sonar scan of the entire wreck created by the NOAA SRVX vessel during their summer of 2013 survey of the site.